Work last week was very busy. In fact, the last few weeks have been full of last minute projects, unexpected fire drills, and a lot of late nights. I far prefer it to be busy at work than for things to be very slow, but I just wish things didn’t get so chaotic so quickly. In the end, it was one of those weeks where even after I came home, I spent as much time on my blackberry as I did trying to enjoy the evening with Hubby. 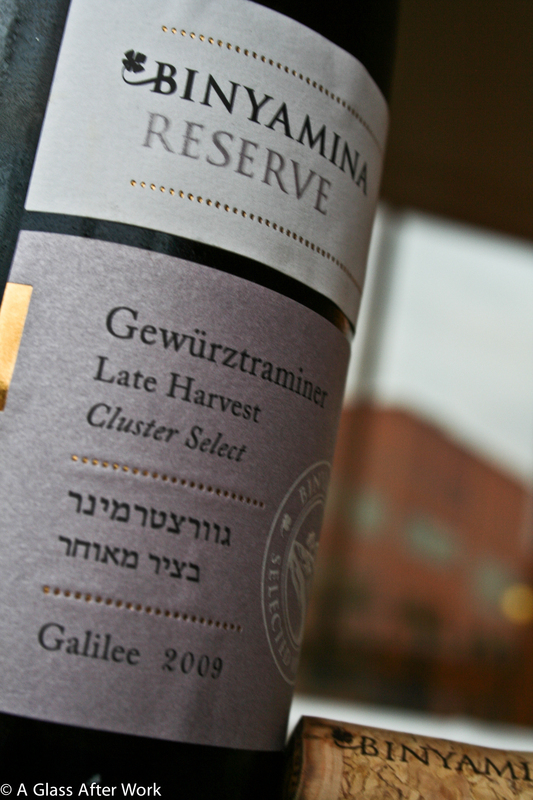 The 2009 Binyamina Gewürztraminer Late Harvest Reserve (winery) is from the Upper Galilee region of Israel. The wine was made with 100% Gewürztraminer grapes, 20% of which were positively affected by botrytis. It had a medium golden yellow. On the nose, there were apricots, mangoes, pineapples, honeydew melons, and honey. In the mouth, there were apricots, pineapple, and honeydew melons followed by hints of honey. The wine was full-bodied with a slight syrupiness and ok acidity. Is this worth a glass after work? Definitely! If you see this wine in the store, grab it; you won’t be disappointed. At $25, this wine pushes the reaches of most wallets for an every day wine, but if you have a spicy dish on the menu for dinner, this is a wine that would make a great accompaniment. I could have used a touch more acidity to balance out the sweetness, but overall, it was a very enjoyable wine with beautiful flavors. I paired it with Hubby’s lamb vindaloo and curried cauliflower, which was an outstanding combination. Hubby was practically laughing at me for how much I liked the pairing. Question of the Day: Do you enjoy drinking sweet wines on their own? Have you tried pairing a sweet wine with spicy food? Do you have a favorite combination? Glad you liked it – a terrific wine and good effort from Binyanmina which has really reinvented itself these past few years (you can see my post at: http://www.yossiescorkboard.com/?page_id=819). Given that you liked this wine, I recommend trying the 2010 Single Vineyard Kayoumi Riesling from Carmel as well. Less residual sugar but still a great food pairing and one of the best kosher dry[ish] Rieslings.